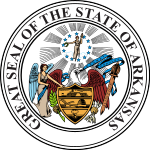 The Arkansas gubernatorial election of 1990 took place on November 6, 1990. Incumbent Democratic Governor Bill Clinton won re-election in a two-way race against Democrat turned Republican Sheffield Nelson with more than 57% of the vote. This was Clinton's fourth consecutive, and fifth overall, term as Governor of Arkansas, as well as his final term (he was elected to the presidency in 1992).